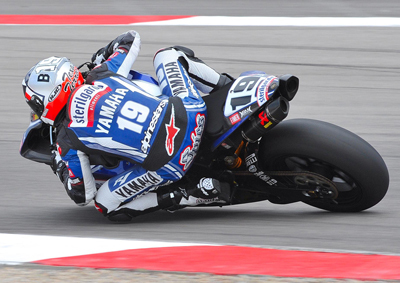 Ben Spies on his way to winning the World SuperBike race at Miller Motorsports Park, Salt Lake City, Utah, May 31, 2009. "Venues like Assen, Monza and Kyalami are the world stages on which Spies and his fellow competitors from 10 countries scrape knees and elbows on asphalt as they joust for the title of World Superbike (WSBK) champion. The Texan’s weapon of choice is a 1000cc Yamaha R1 motorcycle, producing around 220hp. I’m guessing it weighs in the region of 300 pounds, so this is one serious recipe for speed. In appearance it resembles the crotch-rocket one can purchase in a showroom, but weighs a lot less and has many modifications, including trick suspension, tires and brakes – ‘go fast’ stuff that Joe public cannot easily obtain. The factory machine, prepared and run by an Italian squad, will likely catapult its rider from 0 to 60 mph in around 1.8 seconds and on to 200 mph plus in the blink of eye, all while depositing a thick black stripe on the asphalt. This is not a sport for sissies. Hitting the deck at 180mph is not uncommon during a race weekend. Watching Spies in action it’s hard to believe he is competing in his rookie WSBK year. The kid they now nickname the ‘Texas Terror’ started the season in sensational fashion, shocking the best riders on the planet by taking pole position and winning the first four races of the season. To put it in perspective, in golfing terms, this would be like some upstart PGA rookie winning four tournaments in succession against Tiger Woods and Phil Mickelson. Simply unbelievable! Spies’ dream start had ended by the time the series reached Spain and Italy. A crash or two and then a pair of DNFs, saw him lose his championship lead to arch rival Noriyuki Haga of Japan who rides for the factory Ducati team. Spies arrived in Salt Lake City trailing Haga by a whopping 88 championship points. He had to shine in Mormon-land to stay in contention for the title, and he didn’t let his new armada of fans down. On Saturday Spies broke the Superpole record of fellow Texan Doug Polen when he snatched his seventh consecutive pole position in dramatic fashion as an afternoon thunderstorm shot bolts of lightning over the track. Americans seem to thrive in the hurly burly world of motorcycle racing and Spies is fast becoming a worldwide phenom like fellow Texan, Colin Edwards (Texas Tornado) who won two WSBK world titles in 2000 and 2002. On race day ‘Elbowz’ (another nickname for his aggressive riding) Spies continued to show scintillating form and simply rode away from the angry pack of riders in both 21 lap races. It was to be yet another perfect weekend for Yamaha’s ace. His arch-rival Haga had had a shaky weekend after a major practice crash and failed to make the top 6 in both races. The crowd expected some wild riding antics after the double win, yet there was very little showboating from the Texan. The cheering fans got a short wheelie and then a brief wave. No burn outs or flag waving at his home race even though he had just reduced Haga’s championship points lead by 35 points. On the winners’ podium the kid from Texas looked cool and composed. He had just whipped the fastest, meanest, two-wheeled warriors on the planet and set new records in the process, but the look in his eye remained one of steely determination. It was the look and demeanor of a future world champion. ..